The Ionian Sea is an elongated bay of the Mediterranean Sea, south of the Adriatic Sea. It is bounded by Southern Italy including Calabria, Sicily, and the Salento peninsula to the west, southern Albania to the north, and the west coast of Greece. Catania is the second largest city of Sicily after Palermo located on the east coast facing the Ionian Sea. It is the capital of the Metropolitan City of Catania, one of the ten biggest cities in Italy, and the seventh largest metropolitan area in Italy. The population of the city proper is 320,000 while the population of the city's metropolitan area, Metropolitan City of Catania, stood at 1,116,168 inhabitants. The epicenter, epicentre or epicentrum in seismology is the point on the Earth's surface directly above a hypocenter or focus, the point where an earthquake or an underground explosion originates. Subduction is a geological process that takes place at convergent boundaries of tectonic plates where one plate moves under another and is forced to sink due to gravity into the mantle. Regions where this process occurs are known as subduction zones. Rates of subduction are typically in centimeters per year, with the average rate of convergence being approximately two to eight centimeters per year along most plate boundaries. Quaternary is the current and most recent of the three periods of the Cenozoic Era in the geologic time scale of the International Commission on Stratigraphy (ICS). It follows the Neogene Period and spans from 2.588 ± 0.005 million years ago to the present. The Quaternary Period is divided into two epochs: the Pleistocene and the Holocene. The informal term "Late Quaternary" refers to the past 0.5–1.0 million years. A half-graben is a geological structure bounded by a fault along one side of its boundaries, unlike a full graben where a depressed block of land is bordered by parallel faults. Augusta is a town and comune in the province of Syracuse, located on the eastern coast of Sicily. The city is one of the main harbours in Italy, especially for oil refineries which are in its vicinity. Avola is a city and comune in the province of Syracuse, Sicily. Floridia is a town and comune in the Province of Syracuse, Sicily (Italy). Noto is a city and comune in the Province of Syracuse, Sicily, Italy. It is 32 kilometres (20 mi) southwest of the city of Syracuse at the foot of the Iblean Mountains. It lends its name to the surrounding area Val di Noto. 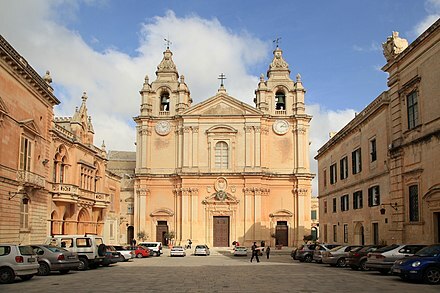 In 2002 Noto and its church were declared a UNESCO World Heritage Site. Ragusa is a city and comune in southern Italy. It is the capital of the province of Ragusa, on the island of Sicily, with 73,288 inhabitants in 2016. It is built on a wide limestone hill between two deep valleys, Cava San Leonardo and Cava Santa Domenica. Together with seven other cities in the Val di Noto, it is part of a UNESCO World Heritage Site. The Province of Syracuse is a province in the autonomous island region of Sicily in Italy. Following the suppression of the Sicilian provinces, it was replaced in 2015 by the Free municipal consortium of Syracuse. Its capital is the city of Syracuse, a town which was established by Greek colonists arriving from Corinth in the 8th century BC. It has an area of 2,109 square kilometres (814 sq mi) and a total population of 403,985 (2016). Syracuse has 8% of the Sicilian population and 8.2% of Sicily's area. Sicilian Baroque is the distinctive form of Baroque architecture which evolved on the island of Sicily, off the southern coast of Italy, in the 17th and 18th centuries, when it was part of the Spanish Empire. The style is recognizable not only by its typical Baroque curves and flourishes, but also by its grinning masks and putti and a particular flamboyance that has given Sicily a unique architectural identity. Val di Noto is a historical and geographical area encompassing the south-eastern third of Sicily; it is dominated by the limestone Iblean plateau. Historically, it was one of the three valli of Sicily. Modica[ˈmɔːdika] is a city and comune of 54.456 inhabitants in the Province of Ragusa, Sicily, southern Italy. The city is situated in the Hyblaean Mountains. Vittoria[vitˈtɔːrja] is a town and comune in the province of Ragusa, Sicily, southern, Italy. With its 62,748 inhabitants Vittoria is the second most populated municipality of the province of Ragusa after Ragusa. The County of Modica was a feudal territory within the Kingdom of Sicily from 1296 to 1812. Its capital was Modica, on the southern tip of the island, although the cities of Ragusa and Scicli housed some government offices for a period. Today it perpetuates as a title only held by the head of the House of Alba, Carlos Fitz-James Stuart, 19th Duke of Alba. The 1908 Messina earthquake occurred on 28 December in Sicily and Calabria, southern Italy with a moment magnitude of 7.1 and a maximum Mercalli intensity of XI (Extreme). The cities of Messina and Reggio Calabria were almost completely destroyed and between 75,000 and 82,000 lives were lost. Netum or Neetum, was a considerable ancient town in the south of Sicily, near the sources of the little river Asinarus, and about 34 km southwest of Syracuse. Its current site is at the località of Noto Antica, in the modern comune of Noto. 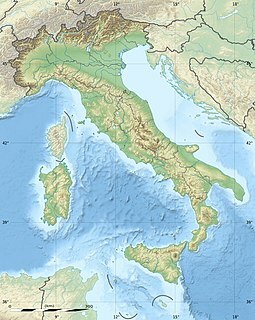 The 1783 Calabrian earthquakes were a sequence of five strong earthquakes that hit the region of Calabria in southern Italy, the first two of which produced significant tsunamis. The epicenters form a clear alignment extending nearly 100 km from the Straits of Messina to about 18 km SSW of Catanzaro. The epicenter of the first earthquake occurred in the plain of Palmi. The earthquakes occurred over a period of nearly two months, all with estimated magnitudes of 5.9 or greater. Estimates of the total number of deaths lie in the range 32,000 to 50,000. The Strada statale 115 Sud Occidentale Sicula (SS115), is one of the major roads in Sicily, Italy. It is the major state highway running along the south coast and connects the towns of Trapani and Syracuse via Agrigento and Ragusa. It is 383 km long. It is a part of the E45 and E931 European routes. The 1169 Sicily earthquake occurred on 4 February 1169 at 08:00 local time on the eve of the feast of St. Agatha of Sicily. It had an estimated magnitude of between 6.4 and 7.3 and an estimated maximum perceived intensity of X (Extreme) on the Mercalli intensity scale. Catania, Lentini and Modica were severely damaged. It triggered a tsunami. Overall, the earthquake is estimated to have caused the deaths of at least 15,000 people. Angelo Italia was an Italian Jesuit and Baroque architect, who was born in Licata and died in Palermo. The Metropolitan City of Catania is a metropolitan city in Sicily, southern Italy. Its capital is the city of Catania. It replaced the Province of Catania and comprises the city of Catania and other 57 municipalities (comuni). Seismic risk in Malta is considered to be low with little historic damage noted and no known victims. The archipelago is however in a potentially significant seismic zone and the risk to the population is probably undervalued. 1 2 3 4 Bonajutus, V. and M. Malpighius. "An Account of the Earthquakes in Sicilia, on the Ninth and Eleventh of January, 1692/3" Philosophical Transactions of the Royal Society. January 1, 1694 18:2–10. 1 2 National Geophysical Data Center. "Significant Earthquake" . Retrieved 11 January 2012. 1 2 3 4 5 6 7 8 9 10 11 12 13 14 Guidoboni, E.; Ferrari G.; Mariotti D.; Comastri A.; Tarabusi G. & Valensise G. "Catalogue of Strong Earthquakes in Italy (461 BC – 1997) and Mediterranean Area (760 B.C. – 1500)". INGV-SGA. Retrieved 20 November 2011. 1 2 Gutscher, M.-A., J. Roger, M.-A. Baptista, J. M. Miranda, and S. Tinti (2006), Source of the 1693 Catania earthquake and tsunami (southern Italy): New evidence from tsunami modeling of a locked subduction fault plane, Geophys. Res. Lett., 33, L08309, doi : 10.1029/2005GL025442. 1 2 Armigliato, A.; Tinti S.; Zaniboni F.; Pagnoni G. & Argnani A. (2007). "New contributions to the debate on the cause of the January 11th, 1693 tsunami in eastern Sicily (Italy): earthquake or offshore landslide source (or may be both)?". American Geophysical Union, Fall Meeting 2007, Abstract #S53A-1019. 53: S53A–1019. Bibcode:2007AGUFM.S53A1019A. 1 2 3 United Nations Educational, Scientific and Cultural Organization. "Late Baroque Towns of the Val di Noto (South-Eastern Sicily)". World Heritage List. UNESCO. Retrieved 22 November 2011. ↑ Catalano, S.; De Guidi G.; Monaco C.; Tortorici G. & Tortorici L. (2008). "Active faulting and seismicity along the Siculo–Calabrian Rift Zone (Southern Italy)". Tectonophysics. Elsevier. 453 (1–4): 177–192. Bibcode:2008Tectp.453..177C. doi:10.1016/j.tecto.2007.05.008. 1 2 3 4 5 6 7 Bianca, M.; Monaco C.; Tortorici L. & Cernobori L. (1999). "Quaternary normal faulting in southeastern Sicily (Italy): a seismic source for the 1693 large earthquake". Geophysical Journal International . London: Royal Astronomical Society. 139 (2): 370–394. Bibcode:1999GeoJI.139..370B. doi:10.1046/j.1365-246X.1999.00942.x. ↑ Billi, A.; Minelli L.; Orecchio B. & Presti D. (2010). "Constraints to the Cause of Three Historical Tsunamis (1908, 1783, and 1693) in the Messina Straits Region, Sicily, Southern Italy" (PDF). Seismological Research Letters. Seismological Society of America. 81 (6): 907–915. doi:10.1785/gssrl.81.6.907. Archived from the original (PDF) on 25 February 2012. Retrieved 20 November 2011. ↑ Rodríguez de la Torre, Fernando (1995). "Spanish sources concerning the 1693 earthquake in Sicily" (PDF). Annali di Geofisica. 38 (5–6): 531. , Table I. List of aftershocks 1693–1694 from the AGS documents. ↑ Gerardi, P.; Barbano M.S. ; De Martini P.M. & Pantosti D. (2008). "Discrimination of Tsunami Sources (Earthquake versus Landslide) on the Basis of Historical Data in Eastern Sicily and Southern Calabria" (PDF). Bulletin of the Seismological Society of America. 98 (6): 2795–2805. Bibcode:2008BuSSA..98.2795G. doi:10.1785/0120070192 . Retrieved 20 November 2011. ↑ Scicchitano, G.; Costa B.; Di Stefano A.; Longhitano S. & Monaco C. (2008). "Tsunami deposits in the Siracusa coastal area (south-eastern Sicily)" (PDF). Rend. Online SGI Note Brevi. Società Geologica Italiana. 1: 159–162. Archived from the original (PDF) on 2012-02-25. Retrieved 21 November 2011. ↑ Smedile, A.; De Martini P.M.; Pantosti D.; Bellucci L.; Del Carlo P.; Gasperini L.; Pirrotta C.; Polonia A. & Boschi E. (2011). "Possible tsunami signatures from an integrated study in the Augusta Bay offshore (Eastern Sicily—Italy)". Marine Geology. Elsevier. 281 (1–4): 1–13. Bibcode:2011MGeol.281....1S. doi:10.1016/j.margeo.2011.01.002. ↑ Feuillet, N.; Cocco M.; Musumeci C. & Nostro C. (2006). "Stress interaction between seismic and volcanic activity at Mt Etna". Geophysical Journal International. London: Royal Astronomical Society. 164 (3): 697–718. Bibcode:2006GeoJI.164..697F. doi:10.1111/j.1365-246X.2005.02824.x. 1 2 Tobriner, S. (1982). The Genesis of Noto: An Eighteenth-century Sicilian City. Studies in Architecture. 21. University of California Press. pp. 27–37. ISBN 978-0-520-03526-3. ↑ Siracusa-sicilia. "Avola" . Retrieved 20 November 2011. ↑ Siracusa-sicilia. "Noto Antica" . Retrieved 20 November 2011. ↑ Valdes, G. (2003). Art and History: Sicily. Casa Editrice Bonechi. p. 9. ISBN 978-88-476-0756-9 . Retrieved 22 November 2011. ↑ Condorelli, Stefano. "The Reconstruction of Catania after the Earthquake of 1693". Proceedings of the Second International Congress on Construction History (Queens' College Cambridge 2006), Exeter, Short Run Press, 2006, I, Pp. 799–815.